Have you ever woken up one morning with an epiphany to make something as a solution to both clear your fridge and make someone very happy? Okay maybe not an epiphany to be exact but more like a Eureka! moment. Awhile ago I ended up with a situation in the form of eight egg whites sitting in my fridge after making a batch of semperit butter cookies to celebrate Eid. Now, before you breathe a sigh of macaron(! ), let me just say that while I have no qualms of making them, I don't really enjoy eating them as much as say... a pavlova. So on the morning of the day we were supposed to go to what was to be my final Syawal celebration dinner of the year at Najah's, I sat up in bed thinking of surprising her with something she's always been telling me to make ever since she saw me whipping up the classic pavlova last year. Alexis, one of our favorite hang out place when we were both still back in Kuala Lumpur, carries this little piece of work they call the chocolate nutty meringue. They also have the classic version with loads of whipped cream and some fruits which they call a pavlova but having not eaten this nutty one, I'm not sure whether it's really just a meringue or a pavlova, which I trust you know the difference. 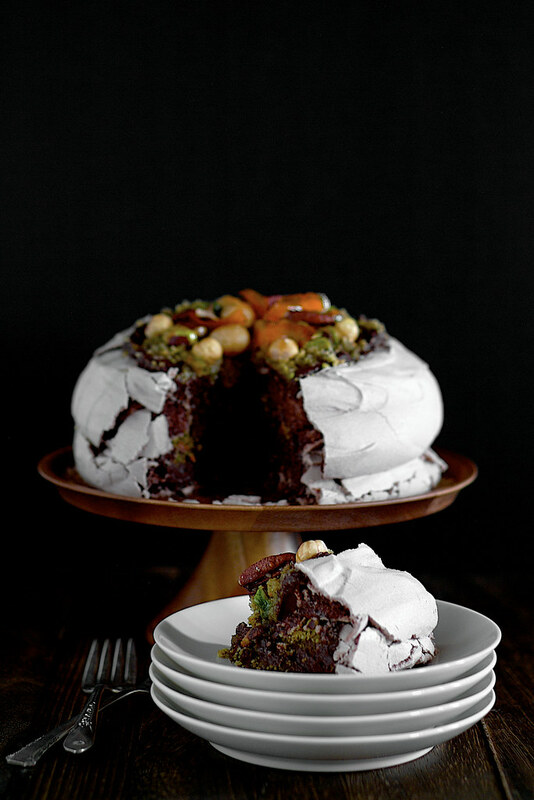 With no recipe from Alexis (obviously) to work with, all I knew was that I had to make a couple of chocolate pavlova layers and stick a lot of nuts in between. Just great, I thought, to use up all those egg whites. 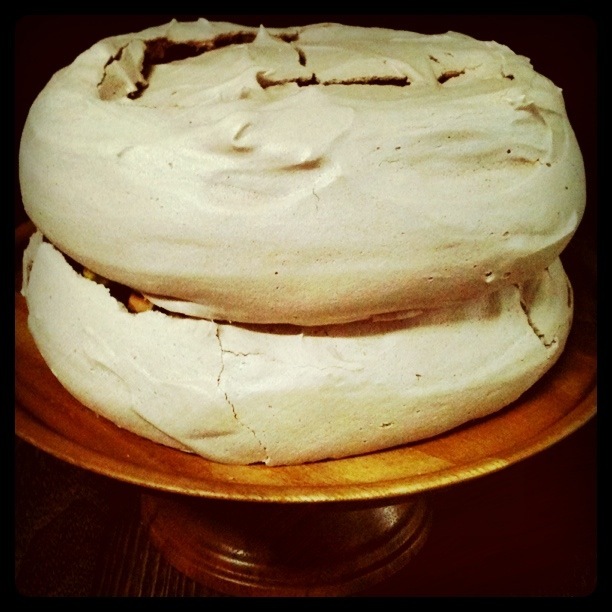 Only my first batch of meringue turned soft after I folded in three tablespoons of cocoa to the classic pavlova recipe. I didn't even add any chopped or melted chocolate to risk weighing it down further. In a panic, I returned the liquid meringue to the mixer with the hopes of bringing it back to its fluffy, airy previous life, to no avail. So I washed up, dried down and beat up the rest of the four egg whites with a different approach. While the mixer is still running in the last few minutes before the meringue is done, I sifted the cocoa powder into the mixer. This time the meringue didn't soften as much, but was still slightly compromised. It was still stiff enough to hold its shape on the baking paper, so I went ahead and baked it. In one big piece. In didn't occur to me at that time that I could bake two smaller rounds to stack them without making another batch - which meant going to the store because I no longer have any eggs in the flat (this happen all the time to me, ingredients running out when baking/cooking mishaps happen, I swear it's all a conspiracy!). The second batch didn't turn out as well using the same method, it spread a little more in the oven outside of the 7-inch size I initially shaped (kind of like what most people experienced here). 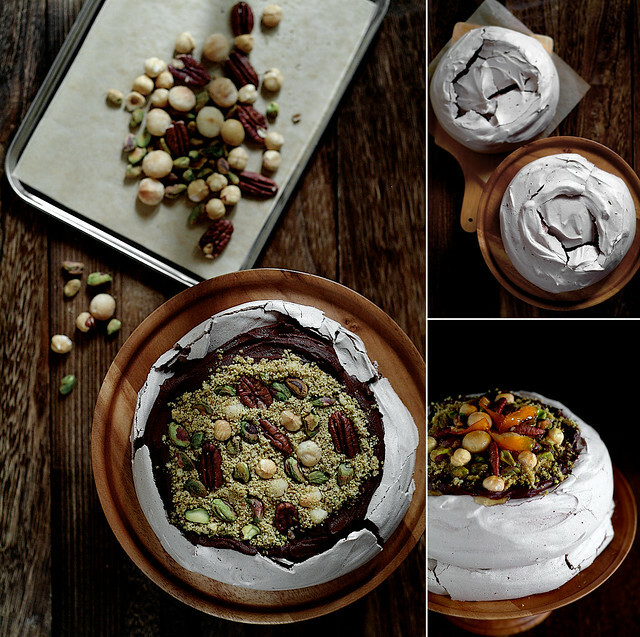 So I presented Najah's with what looked like an out-of-space, crackled chocolate UFO frenzy decked with nuts (above leftmost Instagram photo) which I tried to pass on as the meringue she would want to eat and bring back fond memories. Despite the proclamation by an Aussie friend that "this is not really a pavlova" (not going to argue with an Australian there, this national dessert thing they have along with the Kiwis is sensitive territory), the hostess called it breathtakingly beautiful and most of it was gone from the dinner parties' plates and I was happy that the marshmallowy interior held up. The next day I was still not at ease after making such a horrendous dessert and fiddled with the idea of a second attempt. Then I was told that Alexis's version had ganache in between. The only right thing to do was to test the recipe again with more adjustments. So with the new batch, I sifted the cocoa beforehand, added it into the stiff meringue once it's done and stopped the machine. In went the cocoa and then just about a hair more than one second of whisking at high speed to mix. (If you have a KitchenAid, be amazed at how many rotations it makes in one blinding second at speed 10.) It worked. This time the meringue was strong and I could shape it into two tall 5-inch-ish rounds. With some temperature adjustments, the meringue dried out perfectly, so I was elated and stuck in some of my leftover chocolate sour cream frosting (from this cake) in between the layers instead of a ganache. Now if you're still here and your eyes are still not glazed over with all this egg-white-beating talk, you may or may not notice with some Math that at the end of this fiasco, I got myself stuck with eight egg yolks besides a prettier and tastier pavlova. As the stars all decided to align themselves and all was meant to be (it's another conspiracy I tell you! ), they were, in the end not wasted and made it sunny-colored lemon curd of this cake. 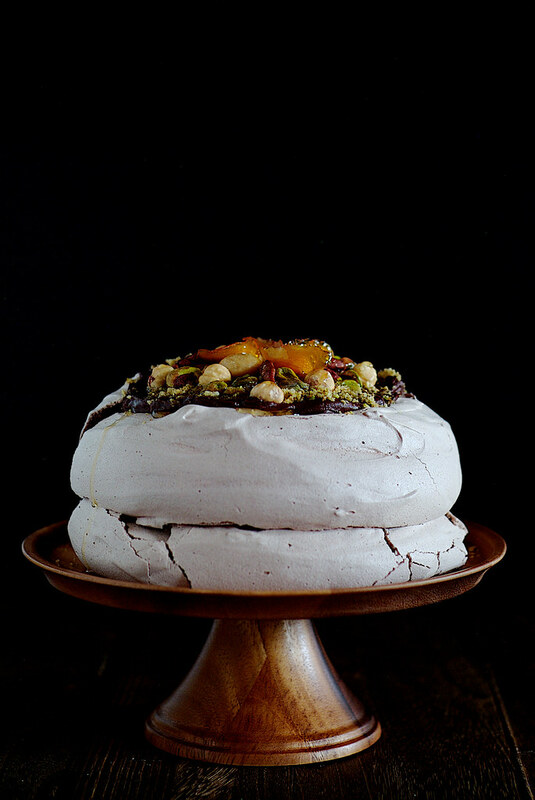 Adapted from this classic pavlova recipe, first seen at Deb's Smitten Kitchen. Note: If you're not a fan of sour cream or have tried the sour cream frosting recipe from Deb's best birthday cake and is still partial to it, you can replace the topping with some hazelnut cream instead. Simply whip up 300 milliliters of cold whipping cream with 1 1/2 tablespoons of hazelnut butter or Gianduja chocolate hazelnut spread a.k.a. Nutella. The orange syrup can be made by reducing 1 cup sugar with 1 cup water along with the juice of one orange, its peel and a stick of cinnamon until thick. Reserve the candied orange peel as a simple garnish. Leftover syrup keeps up to 2 weeks in the refrigerator. Preheat oven to 350°F/180°C and place wire rack in center of oven. Line a baking sheet with parchment paper and draw 2 5-inch circles on the paper, leaving ample space in between them, marked side facing down (or if you're making a single large pavlova, draw 1 7-inch circle in the middle). Pour the vanilla and vinegar into a small cup. Stir the cornstarch into the sugar in another small bowl. In a large bowl of a heavy-duty mixer, fitted with the whisk attachment, whip the egg whites and salt, starting on low, increasing incrementally to medium speed until soft peaks/trails start to become visible, and the egg white bubbles are very small and uniform, approximately 2 to 3 minutes. Increase speed to medium-high, slowly and gradually sprinkling in the sugar-cornstarch mixture. A few minutes after these dry ingredients are added, slowly pour in the vanilla and vinegar. Increase speed a bit and whip until meringue is glossy, and stiff peaks form when the whisk is lifted, 4 to 5 minutes. Stop the mixer and lift the whisk. Make a small well in the stiff meringue and place the cocoa powder in it. Replace the whisk into the meringue and beat on high speed till just combined, for about 1-2 seconds. Fold with a spatula 2-3 times to mix the cocoa in well. Gently spread the meringue about 1/2-inch inside the circles drawn on the parchment paper, smoothing the edges, making sure the edges of the meringue are slightly higher than the center. The meringue cake will spread about 1 inch as it bakes. Place the meringues into the oven and reduce the temperature immediately to 300°F/150°C. Bake for about 1 hour 30 minutes or until the outside is dry and takes on a very pale chocolate cream color. Check on the meringues at least once during the baking time without opening the oven. If they appear to be taking on color or cracking, reduce temperature by 25°F/10°C and turn the pan around. When the meringue is done, turn the oven off, leave the door slightly ajar, and let the meringue cool completely in the oven. This will take at least another 45 minutes to an hour, so be patient. Meanwhile, prepare the topping of your choice. Roast the nuts gently in a frying pan to release their aroma. Let cool for about 20 minutes. Finely grind half of them in a food processor or roughly chop them up. 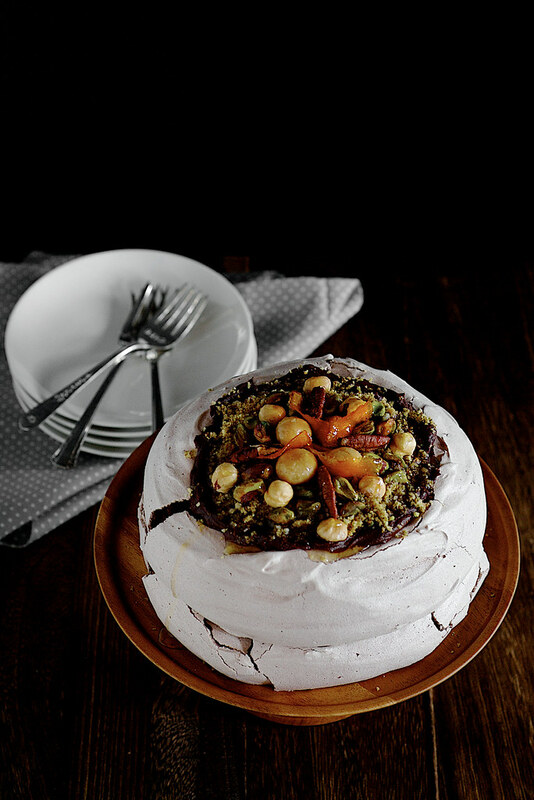 To assemble the stacked pavlovas, place one of the cooled meringue cakes on a serve plate or cake stand. Top and spread gently with 1/2 cup of chocolate sour cream frosting and sprinkle on some ground nut mixture. 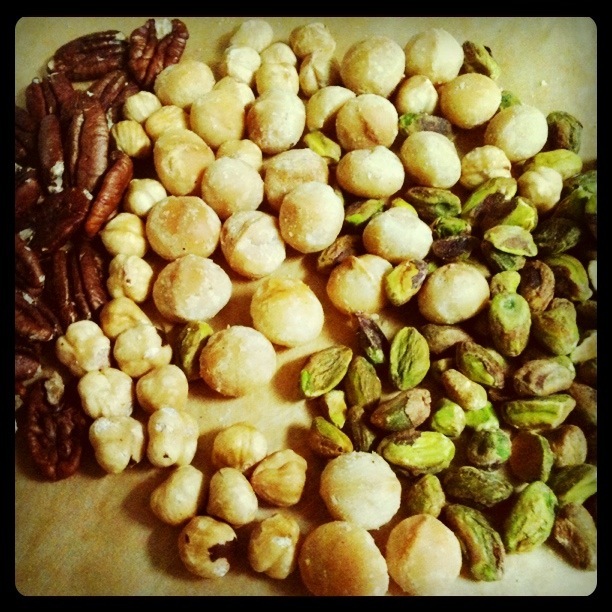 Add on some roasted whole nuts. Carefully lift the other meringue cake with a large spatula and place it on top. Spread on remaining frosting and nuts. Just before serving, drizzle on orange syrup and decorate with some candied orange rind. Do ahead: The meringue cake keeps well in the oven until it is needed. You can also bake the meringue the day before and store it in an airtight container. That pavlova looks just out of this world! A beautiful dessert that must taste divine. I actually like the 'dark' treatment of these photos! Were they shot at night? omggggg. absolutely gorgeous! i love the mood created by the lighting. love! This is soooo beautiful. I am totally inspired. It sounds incredible. Thanks. This looks like such a treat!!!!!!! It is an eye candy too! Ju: As my make-shift light bulb with a laundry bag diffuser broke and never did get replaced, I don't shoot at night anymore. These were taken during a thunderstorm, I blocked most of the remaining light from my kitchen window and shot in almost total darkness. Rita: Thanks! The dark mood eh? I like it too, not easy to shoot, but I love it. Tenina: Thank you. Hope you'll make this soon. Mrs Ergül: It was! Much more interesting than the typical whipped cream and fruits version dare I say. Ooh I love cracked chocolote UFO's decked with nuts. 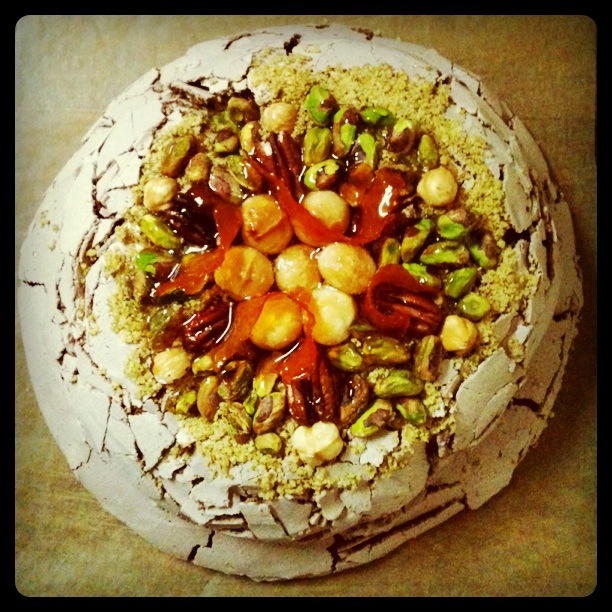 Seriously I love pavlova and I love what you did with the layering and heap-o-nuts. See this is why I can't bake. I don't have the patience to make a recipe a second time to get it perfect (excpet maybe for macarons and that's just because I was plain obsessed). Maybe one day I'll post about that fiasco. I'm so glad I found your site. It's absolutely gorgeous and your stories are hilarious. 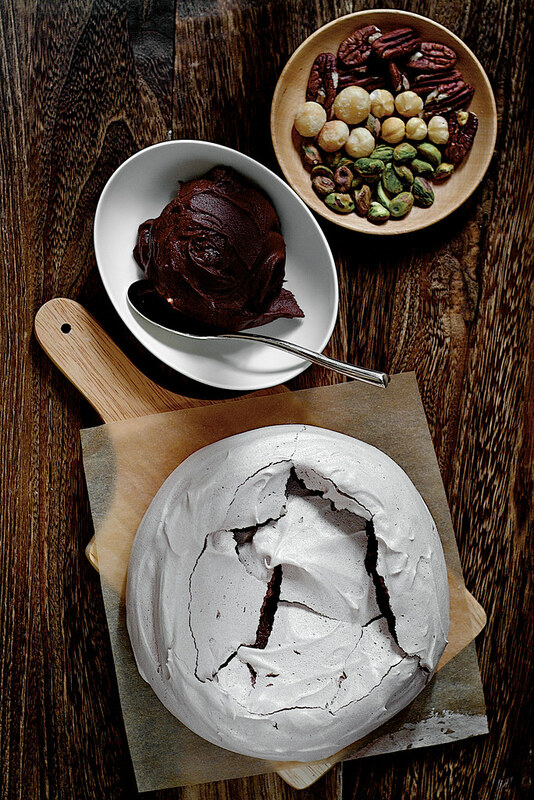 Jamie: You baked Nigella's chocolate pavlova with berries right? (Though I'm not sure why she called it a pavlova when there's no corn starch in hers...) I'm glad I found you too! Lisa: Easy, make make make! how lovely! I loveeeeeeee pavlova! Yeap, a bit too much ^^. My fav version is plain, with lots of fruits. But with chocolate? yes, I want to try! anh: Never too much for me. Try it, you can still do this with lots of fruits! Jesica: Thank you. You can try my pandan chiffon cake recipe as a second attempt on your angel food cake. I like the dark background of your photos. It makes food serious elegant. Thanks Jean! I like dark and moody photos too. Oh My!!! THis is gorgeous!!!! Love the colour and presentation. Thanks Ellena, I'm now going to make this whenever I have leftover egg whites. is there substitute for the white vinegar? That is just an amazing pavlova. I can see myself sinking into all those layers. Your photos are just incredible.